DERP: Imgur, Reddit, Twitch and others are collaborating on a data research platform. Since they have such extensive data access, Internet services experimenting on their users isn’t really surprising. But as examples of the practice trickle out, people have felt increasingly uncomfortable. Now Imgur, Reddit, FARK, Stack Exchange, and Twitch are all partnering to create a platform where academic researchers can do transparent and publicly accessible data projects. 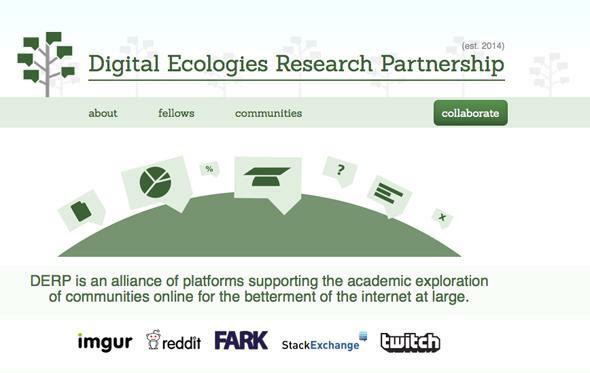 And it’s aptly named the Digital Ecologies Research Partnership … or DERP! It remains difficult to conduct good cross-platform analyses in academic research. By bringing a number of community sites together under a single cooperative effort, we intend to lower the friction of doing so … DERP will only support research that respects user privacy, responsibly uses data, and meets [institutional review board] approval. This doesn’t preclude companies from keeping a private stash of data if they want to, but DERP is meant as a pipeline for academic inquiries and data requests. A list of DERP fellows includes researchers from Harvard, MIT, Georgia Tech, and other institutions. Hwang points out that DERP can assist with research into things like social interaction and information sharing on the Web, as in Stanford’s altruism study on Random Acts of Pizza (a subreddit) that was published in May. It doesn’t change a company’s ability to do what it wants with your data, but at least DERP has a chance of making academic Internet study less, well, derpy.